FILE - Security cameras are seen above the perimeter fence of what Beijing calls a vocational training center, in Dabancheng, in China's Xinjiang region, China, Sept. 4, 2018. Estimates overseas are that more than a million have been caught up by the government extremism dragnet. The paper said that since 2014, nearly 13,000 "terrorists" have been arrested in Xinjiang. Of the 13,000, those who are “assessed to still be socially dangerous” would be relocated to the vocational training centers, or what rights groups called internment camps, after having served their time in jail. FILE - An Uighur woman rests near a cage protecting heavily armed Chinese paramilitary policemen on duty, in Urumqi, in China's Xinjiang region, May 1, 2014. The white paper concludes that Xinjiang is China’s key battlefield to counter terrorism and asserts that its policies in the region have made a great contribution to the globe’s fight against terrorism. The World Uighur Congress swiftly denounced the white paper, calling it a deliberate distortion of the truth, and arguing that China’s forced detention of more than one million Uighurs is unlawful. “Accusations named in the white paper are hostile in nature and lack transparency. Uighurs suppressed and arrested by the local Chinese government there have never been legally convicted through due process before they are identified as terrorists,” argued Dilxat Raxit, spokesman of the Germany-headquartered exile group. “Never has China provided any evidence to back up what it called a series of terrorist [acts],” he said, adding that the accused have no way to defend or clear their names. Raxit said China’s counter-terrorism in Xinjiang represents its disguised efforts to carry out Sinification among the ethnic group. FILE - A police officer checks the identity card of a man as security forces keep watch in a street in Kashgar, in China's Xinjiang region, March 24, 2017. “We urge the international society not to be deceived by China’s continued attempts, through diplomatic means or [international] propaganda, to cover up its true intention of building re-education concentration camps [in Xinjiang],” he said, calling on international society to impose effective sanctions and stop China’s rights violations. He added that, if China has nothing to hide, it should immediately allow the United Nations to send an investigation team to Xinjiang – one of the recommendations Beijing flatly rejected during its five-year periodic review at the U.N. Human Rights Council in Geneva last week. On the sidelines of council meetings, China’s Vice Foreign Minister Le Yucheng told reporters that Beijing may gradually ease back the scale of re-education facilities if Xinjiang’s anti-terrorism fight shows signs of improving. But he insisted that those human rights cases reported in the periodic review are not human rights issues, but issues related to China’s judicial sovereignty and fairness. “This shows China’s attempt to defend their brutal measures in violating human rights principles. Therefore, those who persist in the truth should debunk Chinese official’s narrative,” Albert Ho, the chairperson of Hong Kong Alliance, responded in a press statement on Monday. “This is not some political or abstract issue, ‘Oh, 1 to 3 million people are in the camp’. There is a real human tragedy behind this,” Rushan Abbas Executive director for Campaign for Uighurs, whose sister and aunt as well as other family members were taken to the camps, told VOA. 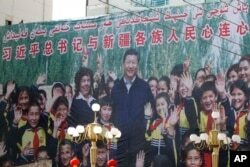 A propaganda poster showing Chinese President Xi Jinping with ethnic minority children and a slogan which reads "Party Secretary Xi Jinping and Xinjiang's multi-ethnic residents united heart to heart" are seen on the side of a building in Kashgar, in China's Xinjiang region, Aug. 31, 2018. James Leibold, an associate professor in Chinese Politics and Asian Studies at La Trobe University, said that the latest report shows that every part of China’s propaganda machine has kicked in to help disseminate its messages across a range of platforms be it social or state media with an aim to win the propaganda war on Xinjiang policies. “As far as I view it, it's an attempt to create a kind of credible and palatable counter-narrative that can be consumed and used by China’s trading partners to disarm growing international criticism of the really severe human rights abuses that are occurring in Xinjiang today,” Leibold said. In the Muslim world, Turkey is the only country that has been outspoken about China’s treatment of Uighurs and other Muslim minorities. In contrast, the Saudi Crown Prince Mohammed bin Salman and Kazakhstan have both sided with China’s anti-terrorism stance. The white paper also sheds light on China's broad definition of what it considers to be extremists. That includes not only those who have been legally convicted but also those who have committed “thought crime,” notes Hong-Kong based Shih Chienyu, secretary-general of the Central Asian Studies Association in Taiwan. 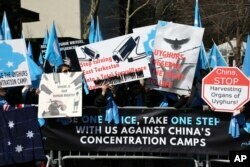 FILE - Uighurs and their supporters rally across the street from United Nations headquarters in New York, March 15, 2018. It means that any Xinjiang Muslim could be regarded as radicalized “provided their words and deeds do not conform [with] official [the state's] interpretations and practices of Islamic teachings in China,” Shih said in a recent report. “The manifestation of radicalism is almost all-embracing, including the ways and content of preaching, marriages and funerals, property inheritance, religious appearance and costumes, and the format of education. Everything in daily life could belong to a category that requires regulation,” Shih added. Shih, however, concluded that China’s strategy in Xinjiang, which involves detention or limiting individual freedom, will turn out to be a counter-productive failure as such a large-scale detention is not only hard to sustain but also invokes resentment that will eventually be difficult to eliminate. VOA's Mandarin Service reporter Adrianna Zhang contributed to this report.